United Way works with 40+ local and regional nonprofit agencies to tackle each of our nine Steps to Success. Get to know these agencies and learn about their partnership with United Way. We invited Communities In Schools of Richmond to tell us about their work. What is Communities In Schools of Richmond’s mission? Communities In Schools of Richmond surrounds students with a community of support, empowering them to stay in school and achieve in life. How does Communities In Schools of Richmond’s Performance Learning Center support the High School Graduation component of United Way’s Steps to Success? There is no doubt that high school graduation correlates with improved life outcomes such as earning higher wages, being healthy and being less likely to commit a crime as compared to peers who did not graduate. CIS identifies students who are at-risk of not graduating as early as elementary school. Through our Integrated Student Support Model (ISS), we develop a pipeline of services to address students’ unmet needs from elementary, to middle, to high school so that students can focus less on their life circumstances and more on school. The Performance Learning Centers offer small academic environments on an accelerated timetable for students who have not found success in a comprehensive high school setting. Students are typically 10 or more credits behind peers, overage and failing. With a successful graduation rate of 97%, students have a second chance to approach diploma requirements with optimism and a desire to graduate. Courses are taught using a blended learning model combining technology and face-to-face instruction from certified teachers who act as learning facilitators. Because work is self-paced, students have the opportunity to catch up to their classmates while also preparing themselves for a career and possibly post-secondary success. The self-paced curriculum and low student-teacher ratio (15:1) helps ensure individual student success. Site Coordinators coordinate workforce development opportunities and service learning in addition to case-managed support for 75 students at two sites. Every one of our stakeholders in the Richmond community leverages another to build a platform of credibility across our network. This collective group of stakeholders, including a leading role of United Way, serves as a seal of approval that the work of CIS is validated by community-driven leadership and meets established goals and indicators that will positively impact our most vulnerable citizens. How has public education in our region changed over the past 10 years? Schools in the City of Richmond and across the nation are not designed or equipped to meet the needs for large numbers of students living at or below the poverty threshold, and certainly not the majority of them. Many RPS kids not only come to school hungry or tired or cold, but they bring with them the chronic and toxic stress that comes along with a life of poverty. The graduation rate for RPS has increased gradually over the last several years, but the district remains significantly behind the state. Based on 2014 data from the U.S. Bureau of Labor Statistics, high school dropouts are nearly three times more likely to be unemployed than college graduates. When employed, high school dropouts earn about $8,000 a year less than high school graduates and approximately $26,500 a year less than college graduates, based on calculations by the Alliance for Excellent Education. Our role at CIS is to try and level the playing field for students by delivering every day school readiness services in high-poverty neighborhood schools so that students can achieve every day success. Looking ahead, what project or initiative has you most excited for the future? The greatest indicator supporting positive graduation rates is the ability to stay on track and graduate with peers. For many Performance Learning Center students, the accelerated pace is critical. Working with the CIS Site Coordinator, students have the option to set attainable goals that will allow them to secure more than the traditional number of credits (7) during a school year. With support and planning, students who are significantly behind can earn their diplomas, graduate with their peers and engage in the workforce development platform that the United Way and our collective community is building for these students. 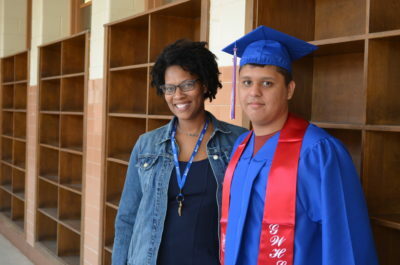 Learn more about United Way’s Steps to Success and the High School Graduation component of our work. Visit Communities In Schools of Richmond’s website.